Poll: Will You Be Watching the Fight of the Century? A combo of file pictures shows Manny Pacquiao in 2010 and Floyd Mayweather Jr. in 2007.
Who's got an extra hundred bucks lying around to put in the pockets of these multimillionaire fighters? 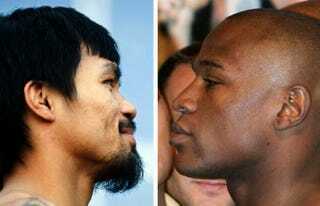 That's the price of pay-per-view to catch what is sure to be the most-talked-about fight in decades. Latest odds are on Floyd Mayweather to defeat Manny Pacquiao in the Saturday-night match at Las Vegas' MGM Grand. If you're a sports fan, this bout is probably irresistible. Let us know if it's on your weekend schedule and who you're hoping will win.